A. R. RUIS is a fellow in the department of surgery and department of medical history and bioethics at the University of Wisconsin–Madison and a researcher in the Wisconsin Center for Education Research.
? "Exceedingly well-written, Eating to Learn, Learning to Eat is an excellent piece of scholarship that fills an important gap in the literature on school lunches." "A valuable, engaging volume for anyone interested in the interconnected histories of scientific research and US policy. Eating to Learn, Learning to Eat is an important historical work that is relevant to many contemporary policy debates around health, education, poverty, and nutrition." "Over the course of about 70 years, school lunches grew from local experiments to a federal entitlement. Eating to Learn, Learning to Eat charts this process masterfully, in fascinating detail. Ruis dissects broad historical movements and events, including first-person accounts that anchor matters of policy in tangible reality." "Chronicling in rich detail the origins, composition and challenges these early school food programmes faced, Ruis offers a history that deepens our understanding of mid-century federal legislation and informs present day policy decisions." "Eating to Learn, Learning to Eat succeeds in bringing a larger historical perspective to the problems of today’s school lunches. By reaching back to the Progressive Era, Ruis reveals a history that rhymes with our own state of affairs." "In Eating to Learn, Learning to Eat, A. R. Ruis, a historian of medicine and public health and an education researcher at the University of Wisconsin–Madison, provides a thorough overview of the history of school lunch policy." "This is a deeply researched, well-written book, which provides a compelling and nuanced historical perspective on current debates about school lunch. By doing so, it illuminates broader historical (and contemporary) social and political questions, such as the responsibilities of government, the separation of the public and the private realm, and the moral imperatives constituted by want." "This book fills a gap in the literature on school lunch by exploring three models for lunch programs that predate the 1946 establishment of the National School Lunch Program (NSLP)." "A worthwhile and engaging read that is a meaningful addition to the literature." 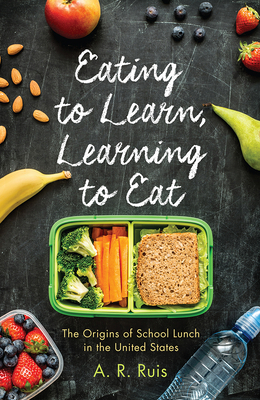 "Eating to Learn, Learning to Eat is a worthwhile and engaging read that is a meaningful addition to the literature."